Alex MacDonald struck a late equaliser for Oxford against Northampton to deny former U's boss Chris Wilder a winning return to the Kassam Stadium. Northampton took the lead just before half-time as Ivan Toney's free-kick bounced in front of keeper Jamie Ashdown, wrong footing him. The visitors failed to find a second goal and MacDonald scored to dent their slim League Two play-off hopes. 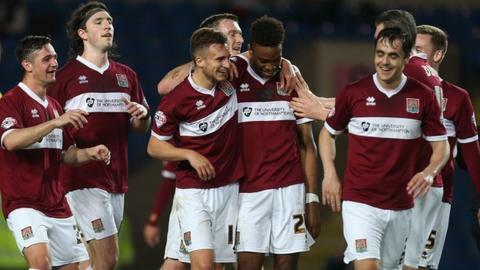 The Cobblers are seven points off the play-off places, with three games left. Match ends, Oxford United 1, Northampton Town 1. Second Half ends, Oxford United 1, Northampton Town 1. Goal! Oxford United 1, Northampton Town 1. Alexander MacDonald (Oxford United) right footed shot from the centre of the box to the bottom left corner. Substitution, Northampton Town. Ben Tozer replaces Ricky Holmes. Corner, Oxford United. Conceded by John-Joe O'Toole. Corner, Oxford United. Conceded by Chris Hackett. Corner, Oxford United. Conceded by Evan Horwood. Substitution, Northampton Town. Marc Richards replaces Ivan Toney because of an injury. Attempt missed. Sam Long (Oxford United) right footed shot from the centre of the box is high and wide to the right. Substitution, Oxford United. Alexander MacDonald replaces Michael Collins. Substitution, Northampton Town. Chris Hackett replaces Diego De Girolamo. Attempt missed. Sam Long (Oxford United) header from a difficult angle on the right misses to the right. Substitution, Oxford United. James Roberts replaces Kyle Vassell. Foul by Kyle Vassell (Oxford United). Lawson D'Ath (Northampton Town) wins a free kick in the attacking half. Substitution, Oxford United. Danny Rose replaces Callum O'Dowda. Attempt missed. Joel Byrom (Northampton Town) right footed shot from the left side of the box is high and wide to the right. Corner, Oxford United. Conceded by Shwan Jalal. Danny Hylton (Oxford United) hits the left post with a left footed shot from the centre of the box. Foul by Evan Horwood (Northampton Town). Kyle Vassell (Oxford United) wins a free kick in the defensive half. Attempt missed. Ricky Holmes (Northampton Town) left footed shot from the left side of the box misses to the right. Attempt missed. Ivan Toney (Northampton Town) left footed shot from outside the box is close, but misses to the left. Attempt missed. Danny Hylton (Oxford United) left footed shot from the centre of the box is close, but misses to the left. Second Half begins Oxford United 0, Northampton Town 1.